For your special day, make sure you hire a DJ that knows and understands weddings and is flexible to make them customized, just for you. By working with your other vendors to ensure that all are working together, we can ensure that everything runs smoothly, from start to finish. 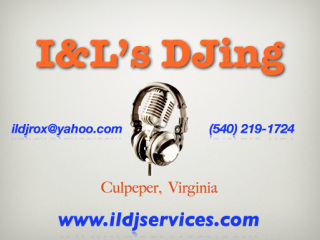 Here at I&L's DJing, we pride ourselves in having the ability to "be in two places at once" with our multiple sound systems; one for your ceremonial music and microphones in one location (if needed) and a separate, larger system for the reception along with our dance floor effects lights which complements the setup wonderfully (upon request). Ian, our master DJ also serves as your master of ceremonies (MC), announcing all of the day's special events and guaranteeing that guests are well informed of all of the activities and when they will be taking place. For weddings we offer package pricing, plus we meet with you in person to answer your questions, offer advice, discuss the music selection, as well as plan and create a time line for all the evening's special events: First dance, cake cutting, toast, etc to ensure nothing during your special day will be forgotten about.